The welding industry has changed at a great pace in recent years with manufacturers developing high technology equipment using modern electronic controls. The rapid rise of inverter based machines, increased demand for quality, repeatability of performance and the development of new materials such as, high strength, lightweight steels which demand new types of equipment and weld processes all mean significant change to the industry. The Wilkinson Welding Academy based in Manchester was established to fill an identified gap in the training industry by providing appropriate training to reflect advancements in welding equipment. We have recognised these changes affect both welding suppliers and equipment users. The academy provides an opportunity to upskill in a 'state of the art' facility that offers the latest welding equipment technology. Our academy trainers have many years practical experience within the industry. Our highly qualified, experienced staff are able to provide training and support at all levels. Their extensive field experience is an invaluable asset in relaying work related practices to the trainees. 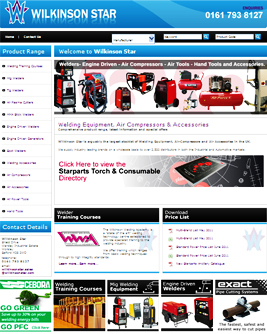 The Wilkinson Welding Academy is an independant training division of Wilkinson Star Limited. With nearly 40 years experience within the welding and cutting markets, Wilkinson Star is arguably one of the largest stockists of arc welding and cutting equipment, resistance welding, air compressors and air accessories in the UK today. Wilkinson Star supply industrial leading brands on a wholesale basis to many thousands of automotive and industrial distribution chains. This is supported by the best after sales service in the business.